Seniors Transportation Access and Resources (STAR), is British Columbia’s specialist in sustainable transportation. 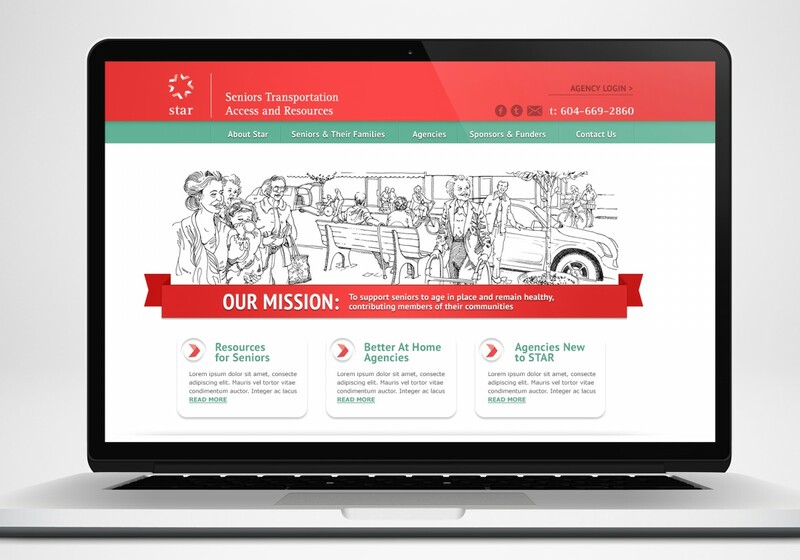 Founded in 2012, it is a leading source for policy and advocacy for safe and sustainable seniors transportation managing the largest, publicly accessible database in B.C. for information on driver transitioning, mobility and community resources seniors and their families. When the Executive Director approached us for our assistance, they were in the process of launching a social enterprise, offering services in the design, development and operations management for community agencies who wished to develop and operate sustainable ride programs; like The BUS Co-op. In order to fulfill their mission, STAR must be involved in the solution development aspect of transportation. Acting as as a hub, they engage with all levels of government, health authorities and community agencies across the province. 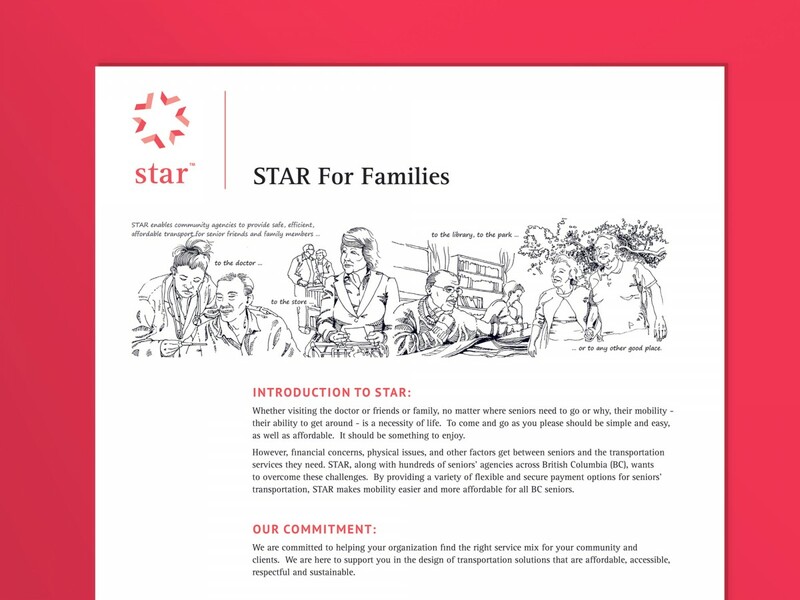 When STAR first approached us, they found it difficult to explain their complex model, and convey their overall value and importance to communities and their well-being. 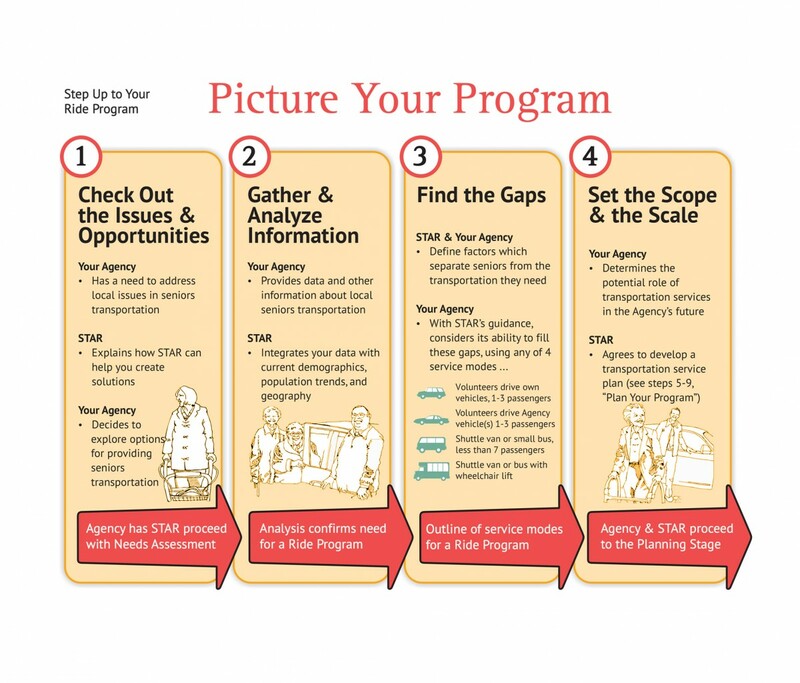 They needed to create clarity within their communications to their specific audiences; especially the community agencies who would become the target client for the social enterprise about to launch. A secondary challenge, was their website. 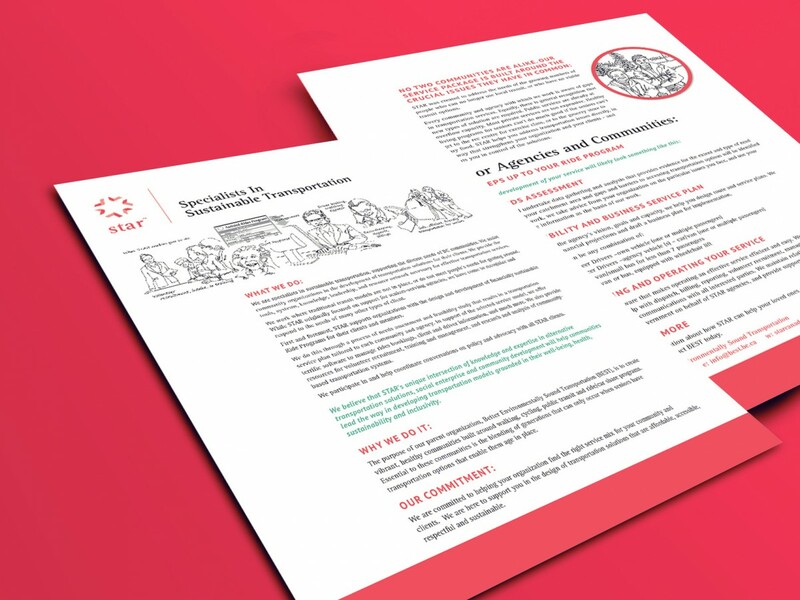 As the leading advocate for sustainable community transportation and policy development in B.C, their website had accumulated a large bank of valuable knowledge and information on seniors’ transportation. The site had grown organically over a 10-year period, making it extremely difficult to search and navigate, and ineffective in achieving its purpose. The success of this multi-layered engagement would rely on our ability to balance meeting their project objectives while applying a limited budget. They needed a team with a flexible approach who could identify where their team’s skills could be best applied in partnership with our expertise. And, to execute a manageable, phased approach that didn’t interfere with the small team’s day-to-day operations. The first milestone of the project was to develop their brand positioning, core messaging and determine the best way to tell the story of their role and impact on community. Working with STAR’s existing writer/illustrator, Don McNair, we collaboratively imagined a way to communicate their story without words – making it accessible to all of their audiences. Through storyboarding and iteration, a series of illustrations was created for use across all marketing collateral and the new website. Working with the stakeholder team, we split their audience into distinct profiles, based on their needs. The outcome of this exercise provided clarity on who they needed to engage with, how to engage with them so that they could deliver on their various mandates. As well, by gaining an understanding of each audience provided the information needed to effectively reorganize the website to make a large amount of content accessible and available to the public. Create infographics for various communications pieces to clearly and concisely and engage the users with compelling imagery and increase the opportunity for dialogue. By helping their leadership team divide and get clear on their primary target audiences, we were able to help them determine how to best engage and communicate with each group to achieve the desired results. 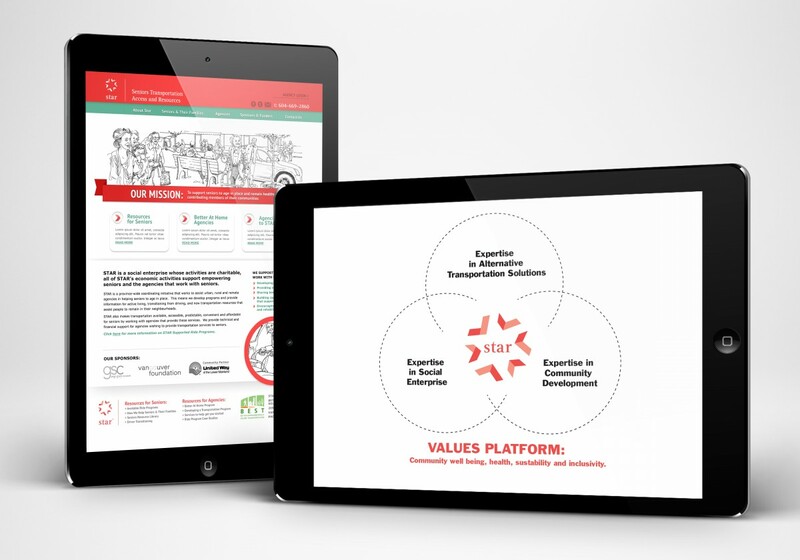 By utilizing the skills of both teams we were able to creatively and effectively apply their budget to where it was needed most putting all of the pieces in place for a successful launch of the social-enterprise. In working with Karley and BIG BOLD BRAND we appreciated having someone who could fit into our team, bringing a solid understanding of the non-profit and social venture sectors. We appreciated her being forthright and honest in her feedback, responsive, flexible, and willing to work to our budget. She is someone who can be trusted to act with honesty and integrity while delivering the promised end results.